What an awesome title. What a cute dragon. Giles Andreae plus Korky Paul. A major must. Sir Scallywag may only be six years old, but he’s a proper knight. With a horse, a lance and a full suit of armour. How cool! He’s gallant, heroic and sometimes a little bit naughty. (His name is Scallywag, after all.) Now evil Baron Greedyguts has stolen King Colin’s sweet machine. The kingdom is in danger of running out of sweets. Sir Scallywag and his trusty steed, Doofus, must put a stop to this villainy. 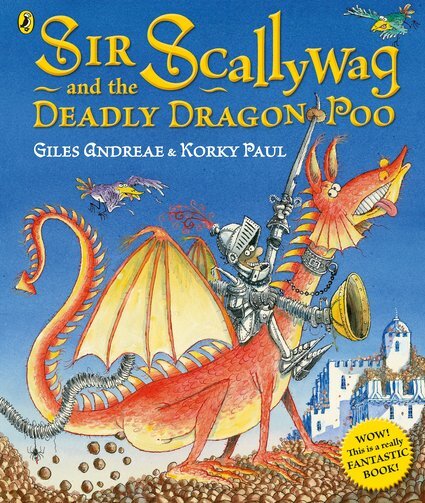 That means danger, chuckles, funny rhymes… and deadly dragon poo!